RAFAEL is about to finish his degree at Havana University, but his mind is elsewhere. The finance and economics he is learning are “what they use here in Cuba”, he explains, ie, not much use anywhere else. Cuba’s socialist government pays for his education but the stipend for living expenses is just $4 a month, enough for ten meals at the university canteen. Additional lunch money comes from his siblings, who live abroad. Rafael (not his real name) wants to go, too. He is looking for scholarships to get a master’s degree in Europe. If he finds one, he plans to stay abroad, where he can earn real money. It will matter to most of Cuba’s 11m people, who have no easy way off the island. In a country where transfers of power are rare, the one about to occur is momentous. Mr Castro, who is 86, is expected to hand power to the “first” vice-president, Miguel Díaz-Canel. 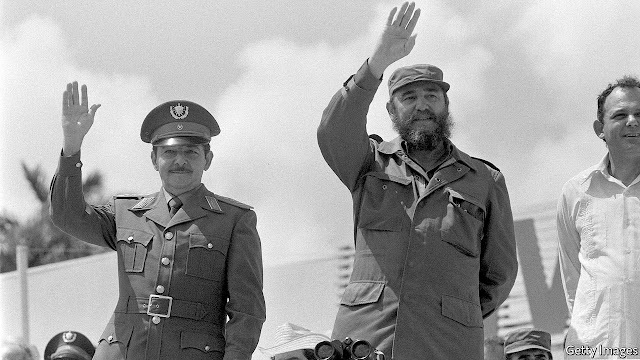 He had not been born when Raúl’s brother, Fidel Castro (pictured right), toppled the American-backed dictatorship of Fulgencio Batista in 1959. The post-revolutionary generation will bring a change in style and raise Cubans’ expectations of their government. It is unclear whether the new leaders will meet them. Mr Díaz-Canel, an engineer by training, has acquired a reputation for modesty during his quiet three-decade ascent through government and the Communist Party. As a leader in his home province of Villa Clara, in central Cuba, he rode around on a bicycle rather than in an official car. At the (one-party) parliamentary elections last month, he queued up with other voters and chatted to the press (Mr Castro zipped in and out of his polling station). His elevation to the presidency will be part of a broader generational change. Several octogenarian conservatives, such as José Ramón Machado Ventura and Ramiro Valdés, will probably leave the council of state, a body with lawmaking powers. Mr Díaz-Canel is expected to replace government ministers with his own people. But substantive change, if it happens, will not be abrupt. Although la generación histórica will no longer run the government day to day, it will still be influential. Until 2021 Mr Castro is expected to remain head of the Politburo, which controls the Communist Party and thus the overall direction of policy. Mr Ventura will remain second-in-command. Mr Díaz-Canel will be only the third most powerful member. He may not be the reformer some Cubans are hoping for. In a speech to a private Communist Party meeting, a video of which was leaked last August, he vowed to shut down critical media and boasted of his efforts to throttle civil society. He called the loosening of the American embargo on Cuba by President Barack Obama starting in 2015 an attempt to destroy the revolution. Mr Díaz-Canel was shoring up his flank to ensure his promotion to the presidency, says William LeoGrande, of American University in Washington, DC. Others see the speech as evidence that Mr Díaz-Canel will be no friendlier to critics of the regime or to the United States than the Castros were. No one expects him to allow opposition parties or to free the press. A more plausible hope is that Mr Díaz-Canel will follow the example of communist parties in China and Vietnam, which opened up markets and allowed citizens to enrich themselves while maintaining political control. But even this may not happen. Attractive as the prospect might sound, Cuban politicians fear it would turn their country into a sweatshop making cheap goods for rich Americans. Socialism, political scientists point out, was less entrenched in Vietnam than it is in Cuba. But Mr Díaz-Canel cannot avoid economic reform of some kind. The economy is in terrible shape and getting worse. Venezuela, whose like-minded regime has provided aid in the form of subsidised oil, is in economic crisis and sending less of it. The fall in trade between the countries, from $8.5bn in 2012 to $2.2bn in 2016, caused Cuba’s first recession since the collapse of the Soviet Union, its benefactor during the cold war. Cuba’s budget deficit reached 12% of GDP last year, in part because the government had to clean up after Hurricane Irma, which struck last September. 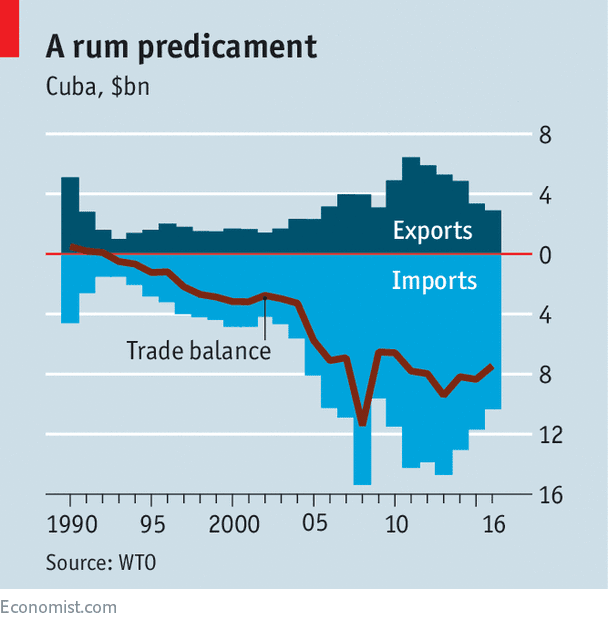 State-controlled farms and factories are incapable of producing the goods Cubans demand, and a lack of foreign exchange makes it hard to pay for imports (see chart). Shortages, of everything from tampons to salt and sometimes electricity, are a plague. This is straining a 60-year-old covenant, under which the regime provides security, free public services and a tolerable standard of living in return for its people’s quiescence. If Mr Díaz-Canel is to maintain it, he will not be able to avoid reforming the absurd system of twin currencies and multiple exchange rates. It distorts price signals, stunts productivity growth and keeps Cubans poor. The convertible peso (CUC), used by tourists and some state-owned enterprises for some purposes, is pegged to the dollar at 1:1. Most wages are paid in Cuban pesos (CUP), which ordinary folk can exchange for dollars at a rate of 24:1. At that rate, the typical government salary is worth $25 a month. There are six other official exchange rates between the two currencies, depending on what sort of organisation is doing the exchanging. For most state enterprises the rate is 1:1, which preposterously overvalues the CUP. Thus, some state firms get vast handouts which make them look productive when in fact they destroy value. In December Mr Castro said that currency reform “cannot be delayed any longer”. But change will be painful. If the currency were suddenly unified and allowed to float, more than half of state-owned firms could go bust, putting hundreds of thousands of Cubans out of work. Members of the regime do not agree on whether the bigger risk is reforming too slowly or too fast. According to foreign diplomats, the government is talking informally to the German government, which has experience in unifying currencies. Without the Castros’ revolutionary mystique, Mr Díaz-Canel’s performance will be judged more exactingly. That both makes economic reforms more urgent, and the short-term pain they will cause more dangerous to the regime. The new president may seek to boost his popularity before administering any economic shocks—by expanding internet access, for example. The government is planning a series of constitutional changes. These are thought to include cutting the number of seats in the National Assembly (from 605) and the number of vice-presidents (from six). The post of prime minister may be reintroduced. There is talk of recognising the right to self-employment in the constitution, a sop to the 580,000 people who work in trades opened up to entrepreneurs by the government. Cubans would vote on the changes in a referendum, giving Mr Díaz-Canel a measure of legitimacy. But Cuba’s increasingly disenchanted people care more about economic results than constitutional tweaks. If Mr Díaz-Canel can deliver those, Rafael and youngsters like him might not dream of exile. Is the Financial Sector Safe Enough Yet? CAMBRIDGE – A decade after the global financial crisis, policymakers worldwide are still assessing how best to prevent bank failures from tanking the economy again. Two recent publications – one from the US Department of the Treasury, and another by Federal Reserve economists – provide an indication of where we are. The US Treasury report examined whether to replace the 2010 Dodd-Frank Act’s regulator-led process for resolving failed mega-banks – the Orderly Liquidation Authority (OLA) – with a solely court-based mechanism. The Treasury’s study was undertaken under instructions from President Donald Trump, who was responding to pressure from several Republican congressional leaders – such as Representative Jeb Hensarling of Texas, the chair of the House Financial Services Committee – who advocate replacing regulators with courts. 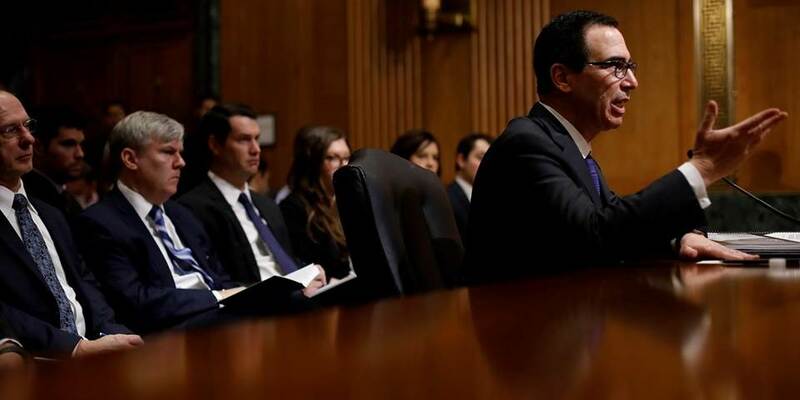 Ultimately, while the Treasury extolled the virtues of basic bankruptcy for failed banks, it rejected repealing regulators’ powers to lead bank restructurings. Hensarling expressed deep disappointment with the Treasury’s conclusion, and he and his colleagues continue to insist that Dodd-Frank is an example of inappropriate government meddling that raises the risks of taxpayer-funded bailouts. But, as the Treasury recognized, eliminating the regulators is a problematic proposition. Restructuring banks in a crisis requires planning, familiarity with the bank’s strengths and weaknesses, knowledge of how best to time the bankruptcy in a volatile economy, and a capacity to coordinate with foreign regulators. The courts cannot fulfill these tasks, especially not in the time currently allotted for a bank bankruptcy – a 48-hour weekend – without regulators’ prior planning and immediate advice, as well as international coordination. Moreover, if multiple mega-banks sank simultaneously, bankruptcy courts could not manage the economy-wide crisis that would follow. They lack the training to devise a nationwide recovery plan. And they are in no position to coordinate proceedings with foreign regulators. Given all of this, eliminating regulator-led restructuring would amount to a big step backward. So the Treasury’s report is good news, especially because, without Treasury support, the House of Representatives may well stop pushing for this change. Yet the second recent publication – by several Fed economists – suggests that there is work to be done. That report’s main conclusion is that restructuring planning is not yet reflected in the market’s pricing of bank bonds. After the crisis, studies by International Monetary Fund staff and others concluded that banks needed much more loss-absorbing equity. In 2009, only five cents of every dollar of funding for many major banks came from equity; the rest was debt (deposits, overnight loans, and long-term loans). So if the bank lost six cents in its operations per dollar of debt, some creditor could not be fully paid. Seeking to avoid losses, many creditors would rush to cash out, putting pressure on the entire banking system and potentially triggering a run. According to the IMF study, most banks could have weathered the crisis effectively if 15 cents of every dollar of funding had come from equity. Yet banks still hold only eight or nine cents per dollar of funding in equity, despite regulators’ pushed for an increase , and the biggest banks have called for reducing even this suboptimal ratio. 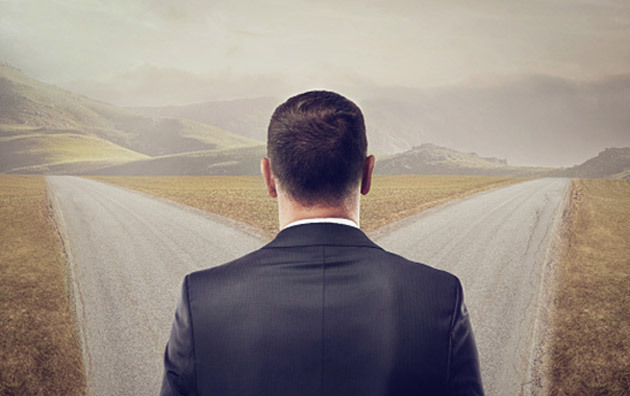 Regulators and bankers have sought a middle ground to boost safety. In addition to the eight cents of equity they are holding, banks are now aiming to hold another eight cents per dollar of debt that could be turned into equity in the course of a weekend. In such a scenario, a damaged bank could absorb more losses and remain in operation, diminishing creditors’ incentive to run. But there is a potential hitch. Under the current plan, certain creditors are designated in advance to absorb a failed bank’s losses once the equity is wiped out. Those creditors’ debts are thus riskier, and should be more expensive to the bank than the debt that is not designated to be turned into equity. Yet the Fed economists conclude that, in the market, this is not the case. Why? The first possibility is rather optimistic: financial markets don’t think there could be another financial crisis during the life of the existing debt. But could markets really believe that there is zero chance of a crisis in the next decade? The risks of, say, a trade war or a fiscal crisis (when the projected trillion-dollar deficits are reached) are real, apparent, and priced by volatile stock markets. Another more neutral possibility is that markets aren’t pricing the different types of debt differently because they do not understand that the plan involves hitting some creditors hard and keeping others safe. But this is also unlikely, because the plan has been well publicized in financial circles, and ratings agencies like Moody’s count the loss-absorbing debt as riskier than banks’ regular debt. The third explanation is more ominous. Maybe financial markets understand the plans, but don’t (yet) find them credible. Weekend restructuring of mega-banks has never been tried, and commentators still see potential hurdles to overcome. Maybe knowledgeable investors assume that, ultimately, banks and the government will not treat the designated loss-absorbing creditors any differently than others. Either everyone will go down, or everyone will get bailed out. If this is the reason, it is disappointing, given how much work has gone into developing both the regulatory-led and the court-led restructuring mechanisms. Mark Roe is a professor at Harvard Law School. He is the author of studies of the impact of politics on corporate organization and corporate governance in the United States and around the world. Economics is the study of people’s rational choices when they’re faced with scarcity and uncertainty. The problem: people aren’t rational. They often act against their own economic interests—or appear to. So we have behavioral economics to figure out why. Now, you might think businesses are different since they focus on the bottom line, not vague feelings. Yet companies can act irrationally just like individuals do… and they may be even less likely to realize it, much less admit it. That’s a shame because everyone might be better off if they did. Not so long ago, work was a daytime, Monday-through-Friday thing for most people. Now much of the US economy runs 24/7. As a result, millions of workers have unpredictable schedules. This is especially common in retailing. 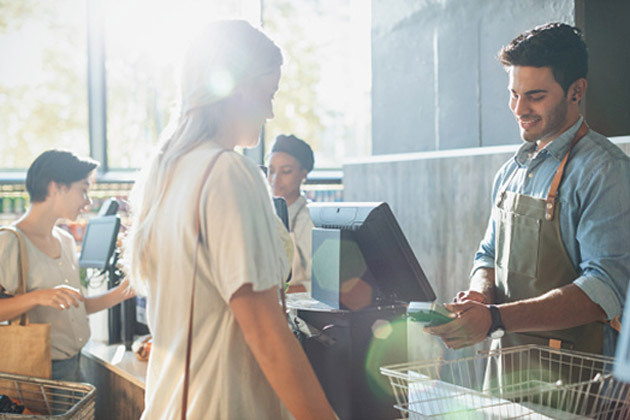 Chain stores use algorithms to match staffing with store traffic. On the surface, that makes sense. Why pay workers to stand around and do nothing? The shareholders expect management to maximize profits. If it’s hard on the workers, well, they can get another job. But what if this hyper-precise scheduling is bad for the business too? One recent study says steady schedules can bring in more revenue. The study randomly assigned about two-thirds of the stores to a so-called treatment group, in which managers were encouraged to provide workers with more consistent start and stop times from day to day, and more consistent schedules from week to week. Many managers were also authorized to slightly increase the total number of payroll hours that they could allocate to their workers. Scheduling at the remaining one-third of the stores continued largely as usual. The result: The change in average sales during the experiment was 7 percent higher at the stores subject to the new policies than at the stores in the control group. So, when managers let people work regular hours, sales rose 7%. 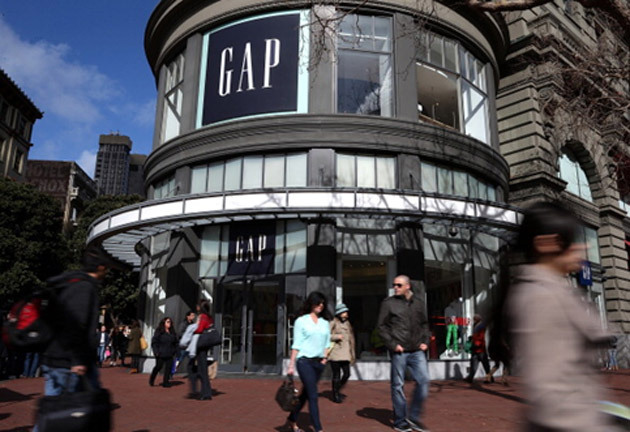 Across a sizable company like Gap, that’s millions of dollars a month. The study found much of the improvement came from reduced employee turnover. Stores with stabilized schedules had more experienced workers, who sold more products. While it’s hard to measure every factor in a study like this, the results suggest something important: treating people as valuable members of the company, instead of as interchangeable parts, can bring better results. For restaurants, then, there’s a direct connection between the hours they are open and the revenue they receive. Or so you might think. Consider Chick-fil-A, whose stores are closed on Sundays due to the founder’s religious beliefs. That turns out to be good business as well. According to trade publication QSR, in 2016 the average Chick-fil-A brought in 73% more revenue in six days than the average McDonald’s did in seven days. Nor is it just McDonald’s. Chick-fil-A sales were triple the average Wendy’s sales, again with one less day per week to do it. Against vigorous competition, Chick-fil-A easily wins the revenue fight with one hand tied behind its back, so to speak. One reason: Chick-fil-A seems to treat its staff well—not so much with higher wages, but opportunities for education and advancement. 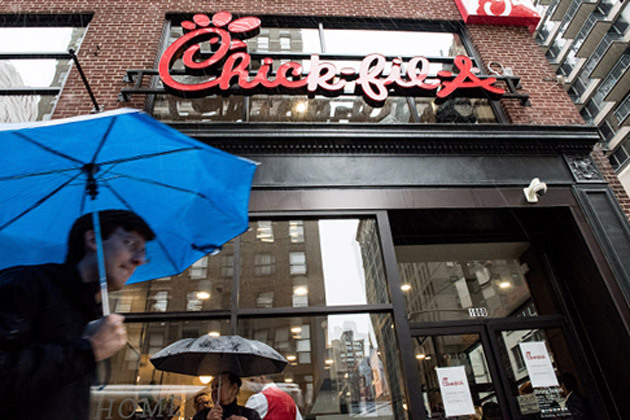 But there’s something else, too: Chick-fil-A workers know they’ll always have Sundays off. I suspect it gives Chick-fil-A lower turnover and better-trained workers. They return the favor by going the extra mile to please customers. Revenue follows. Could other chains do the same? Sure. Strong evidence says it would help productivity and sales. The rational move would be to copy Chick-fil-A’s practice. But they don’t, and some have even gone the other direction, expanding hours to stay open all night. You can probably guess my point. Treating workers as valuable assets instead of disposable tools isn’t just the right moral choice—it’s often the smart financial choice as well. Yet many employers irrationally choose not to. This isn’t new information. In a now-famous 1920s experiment, Western Electric changed the lighting at its plant in Hawthorne, Illinois. It found making the room brighter improved productivity. That makes sense, but then it got weird. They turned the lights down again, and productivity improved even more. Western Electric also varied other employee benefits like break times. In each case, changes increased output. The effect faded with time, but something had obviously happened. The conclusion: it wasn’t so much the changes, but that workers saw management paying attention to them. They worked more efficiently when they thought the company cared about their comfort. Imagine that. Today’s economists and central bankers know productivity is a problem, but they can’t seem to find a solution. Employers responded with measures like algorithmic scheduling in retail stores or all-night hours in fast food. Maybe these changes raise productivity sometimes, but the aggregate economic data suggests they usually don’t—at least not anymore. The next idea: robots and AI. Reduce or even eliminate those pesky humans. But if the Gap experiment and Chick-fil-A’s success mean anything, doubling down on humans might cost less and work even better. It’s something to consider if you own a business. And you don’t need the Fed’s help to do it. You can buy a whole country with $269 billion. But it might not be enough cash to buy Apple Inc. AAPL -1.16%▲ out of its current jam. That jam is the company’s current iPhone cycle, which not as good as expected. The launch of three new iPhone models last year—including the redesigned iPhone X—seems to have cooled early. 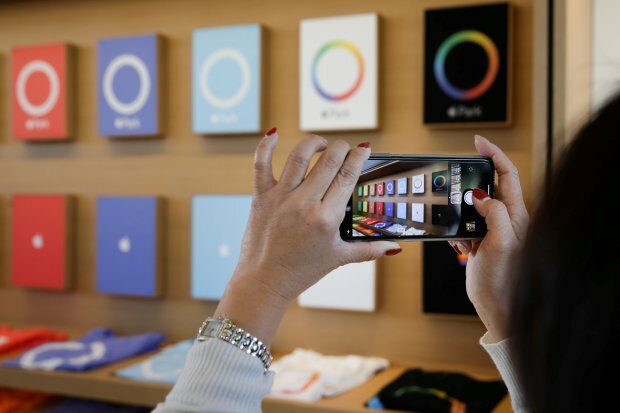 Several companies that supply components for the device have warned investors of weakening demand on their quarterly reports, though they remain careful not to mention the iPhone by name, per Apple’s strictures. Apple’s share price has slipped 9% over the last couple of weeks and is now down 4% since the start of the year. These all may set up a potentially difficult report for the company’s fiscal second quarter, coming Tuesday afternoon. Several analysts have already been trimming their iPhone sales projections for the remainder of the year. And yet the targets may still be too high. 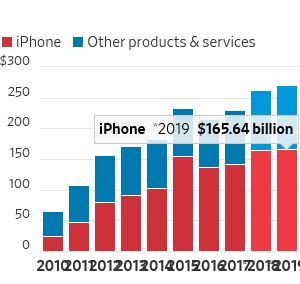 Wall Street’s current consensus has iPhone revenue rising 13% year over year, to $39.2 billion, in the March quarter and up 18%, to $29.9 billion, for the June period. And since unit sales are projected to grow only in the low single digits for those periods, analysts still seem to be counting on a fairly rich dose of the highly priced iPhone X in the sales mix. A downbeat report and forecast won’t do wonders for the stock. But offsetting it this time around could be a capital return bonanza. Apple has typically boosted its dividend and buyback during its springtime report, and this year’s will likely benefit from the $269 billion Apple has stashed overseas that was freed by last year’s tax overhaul. Toni Sacconaghi of Bernstein expects the company to spend about two-thirds of that amount on capital returns over the next 2½ years. Given the unlikelihood that Apple will ever plow that money into a monster deal, the company is right to give back some of the largess. 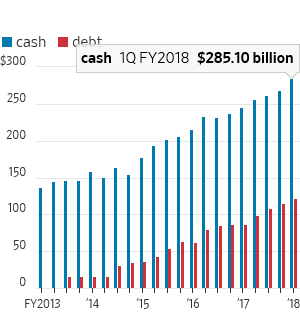 It would also be good to pay down some of the $162 billion in debt that has piled up over the last five years—largely to finance previous capital returns while its cash sat offshore. But Apple’s stock remains closely hinged to its product cycle, and that cycle remains dominated by the iPhone. Some things even a country’s worth of money can’t change.